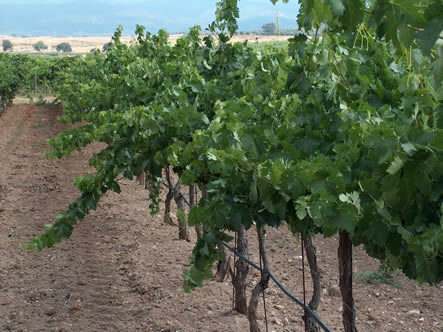 Along the side of one of the vineyards at Cortes de Cima is a long, rather bumpy looking strip, perhaps 20 feet wide - it looks like a couple of vine rows are missing. But this is proprietor Hans Jorgensen's landing strip. Inside a shed at the side of the winery there's a shiny, attractive light aeroplane. This used to be a tool of the trade when Hans worked running sugar plantations in the far east; now I get the impression it is a rather nice toy. Still, he's had rather scared employees hanging out of the side door taking photographs of the vines below in his own take on precision viticulture via airborne monitoring. 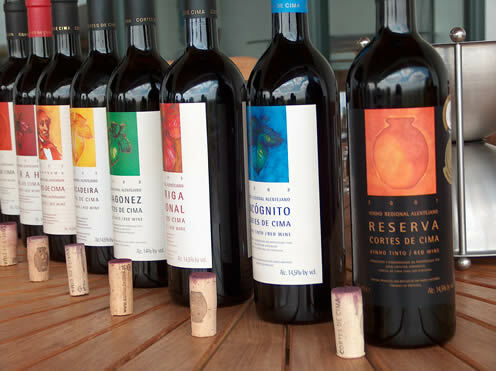 Cortes de Cima is one of Portugal's two leading 'new world' wineries (the other being Esporão), and its very successful wines with good international distribution have helped put this region on the map. 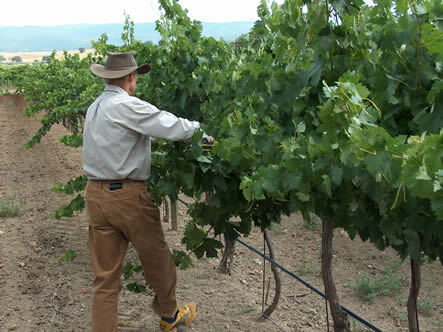 The new world approach begins in the vineyard, where Richard Smart (an Australian who is one of the best known viticultural experts) has been consulting. The vines are trellised here with the Smart-Dyson system (illustrated right). This involves a tall vertical canopy with a special moveable system of catch wires. 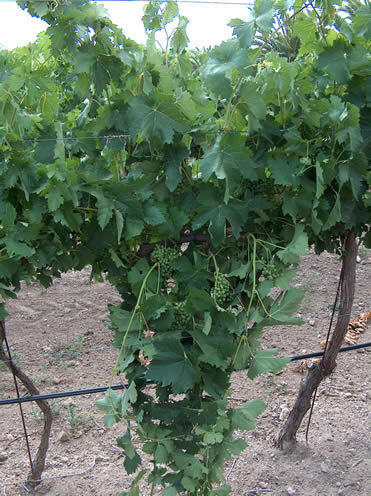 About half way through the growing season, while things are pretty vigorous, the guidewires are used to catch some of the sprawling shoots and direct them downwards. The result is a large green wall - the aim behind this system is to get vigorous vines (usually a bad thing for quality) in balance and produce relatively high yields of good quality grapes. The wines are made in an unashamedly modern mould, and have proved tremendously successful with their accessible, forward fruit. 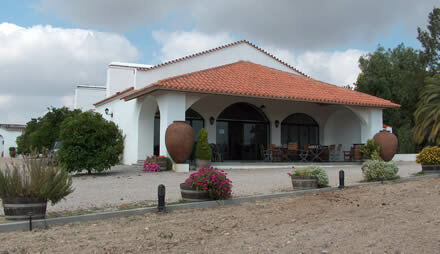 Because of their success, the prices for the top wines are very high in Portugal, which tends to make them look a little expensive in the UK when compared with their peers. Still, you can't blame a winery for their prices: if they sell substantially below market value, then someone else gets to make the margin, which isn't really fare. I especially liked the Syrah 2002, The Touriga Nacional 2003 and the Homage to Hans Christian Andersen, which I thought were superb. The Chaminé, the cheapest wine in the line-up, is hard to resist with its joyful fruit. Hans Jorgensen demonstrates the Smart-Dyson system, catching the foliage with moveable guidewires and directing it downwards. The result: shots grow down as well as up, creating a wall of vines.